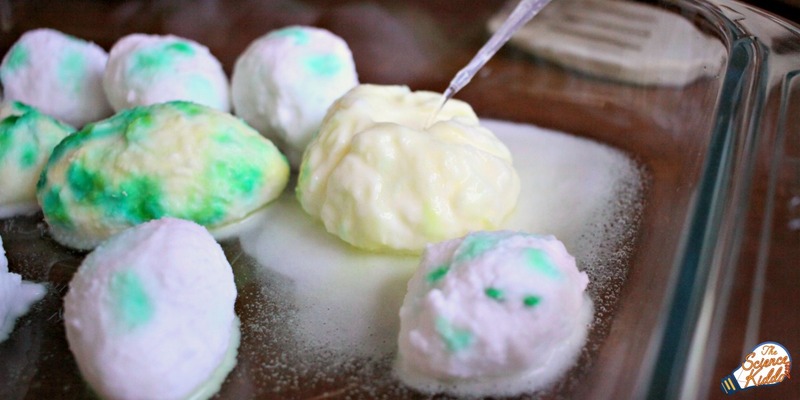 Use a classic science experiment to make and hatch Pokemon eggs using simple kitchen supplies. 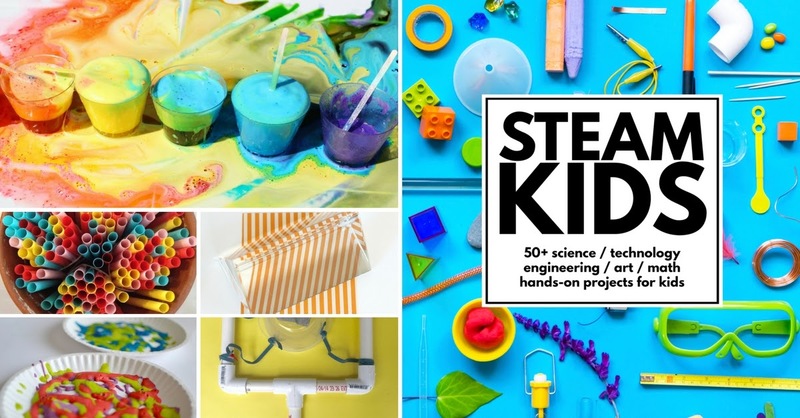 The perfect STEM activity for Pokémon fans everywhere! My kids have been completely Pokémon-crazed since the release of Pokémon Go. Given how many people we see around town catching their own Pokémon, I know they aren’t the only ones! 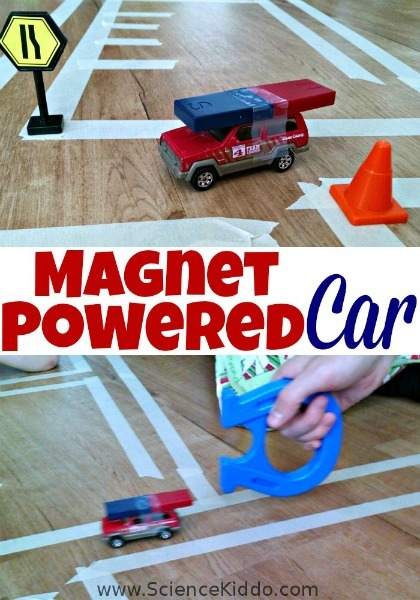 I love to turn my kids’ interests into fun and educational activities. They are always more enthusiastic to dive in and learn with me when I involve their toys and hobbies. 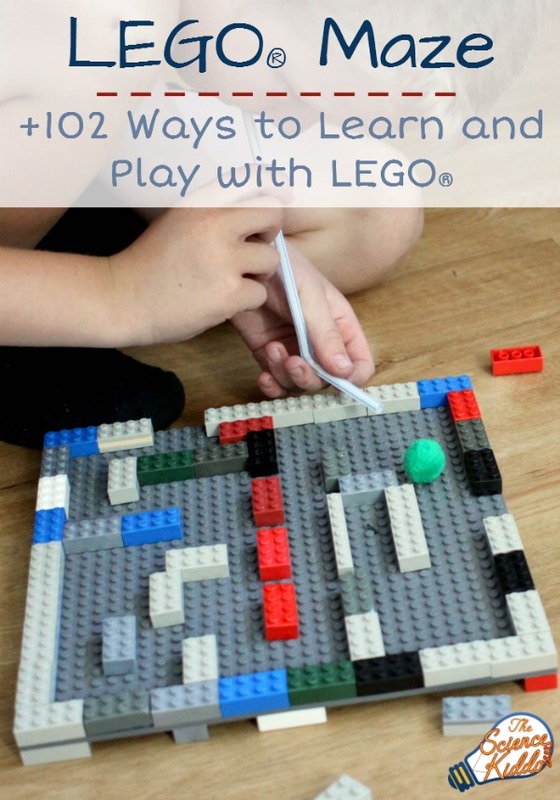 We do the same thing learning with LEGO. The kids have so much fun they don’t even realize they are learning! Over the weekend we made and hatched our own Pokémon Eggs in a fizzy, foamy mess. The kids had so much fun with their fizzing Pokémon Eggs that we have another batch all ready to hatch tomorrow, too! We mixed the baking soda and water together in a 3:1 ratio. 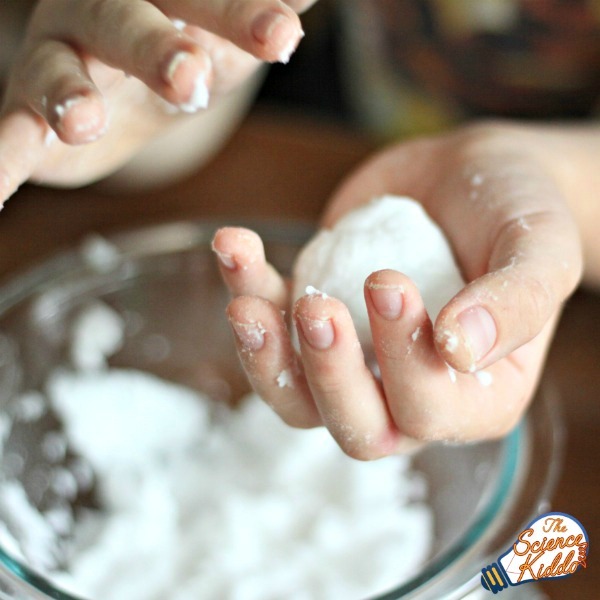 We used about 1 1/2 cups baking soda mixed with 1/2 cup water. It should clump together easily without being too runny. 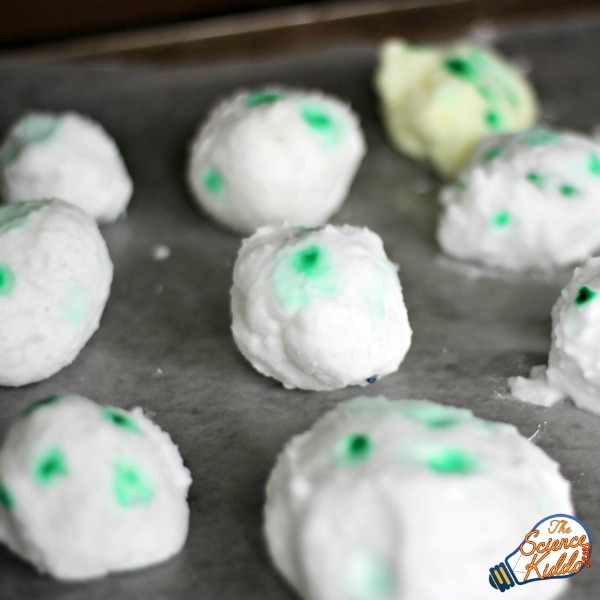 We molded the baking soda mixture around each Pokémon figure in an oval shape and placed them on the baking sheet. 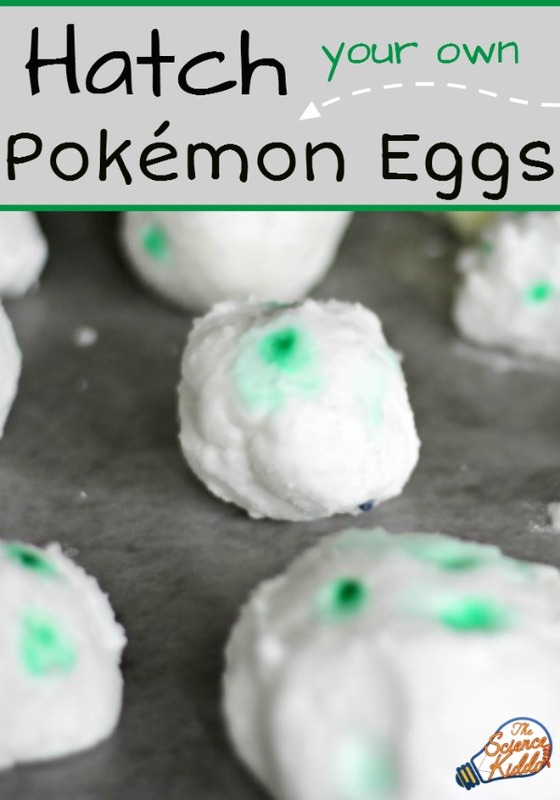 To make the Pokémon Eggs look authentic we dipped one end of a cotton swab into green food coloring and used it to make green polka dots on the egg. Then we placed the baking sheet in the freezer for a few hours until the eggs were frozen solid. We placed the frozen Pokémon Eggs in a casserole dish and tried to guess which Pokémon was in each egg. The kids were so excited to hatch their Pokémon Eggs!! We poured some vinegar into a cup and then used the pipettes to squirt vinegar onto our Pokémon Eggs. 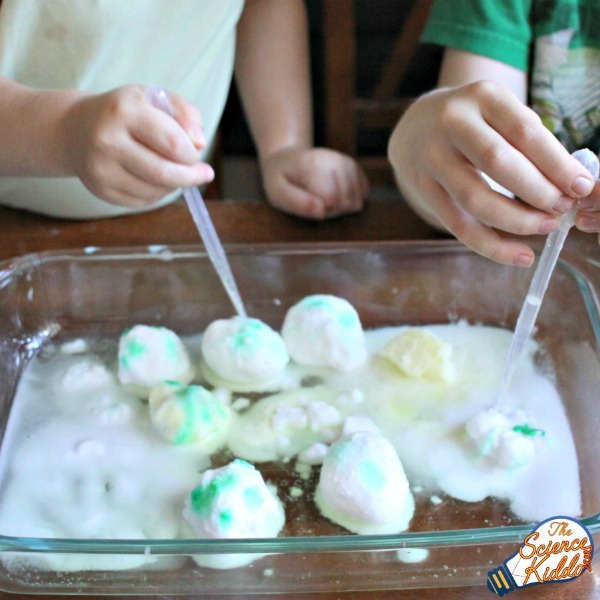 Do you remember what happens when baking soda and vinegar mix?! As our Pokémon Eggs hatched the egg fell apart in a bubbly mess. Little by little we watched the Pokémon emerge from the egg. Once the egg was fully hatched the kids rinsed off the Pokémon in water and started in to hatch another Pokémon Egg. When vinegar and baking soda mix, carbon dioxide bubbles are produced. This is what causes the fizzy bubbles you see as the eggs hatch. 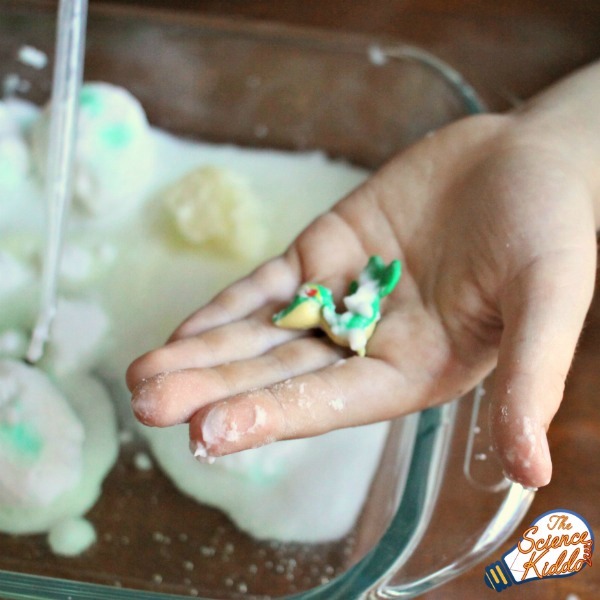 You can explore the reaction between baking soda and vinegar more by making your own fire extinguisher, launching a film canister rocket, and exploring the magic color changing reaction! YES to all things Pokemon! We will try this at home, for sure. My son is considering a Pokemon themed birthday party, and this would be a perfect activity. Do the pokemon eggs have to stay frozen until you use them? Thanks! They will still work if they are not frozen, they’ll just be squishy and difficult to pick up and handle. I like to keep them frozen until we use them because they keep their shape and they are easy to handle. Hi there, I just wanted to say I love this idea and I’m going to do this for my son’s birthday party. I wanted to let you know that your afffiliate links are not working. 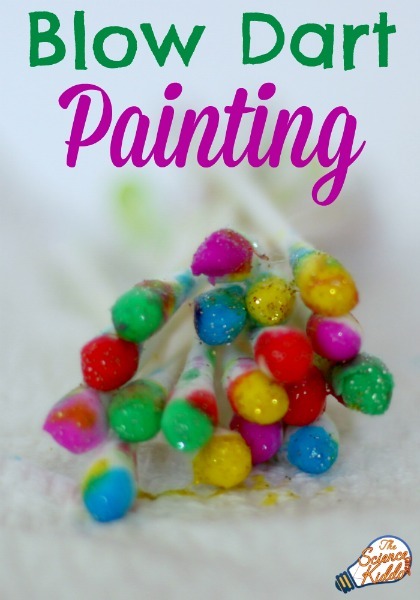 I’m so glad you can use this activity for your son’s birthday! Pokemon activities are always a hit. Thank you so much for letting me know about the Amazon links. I have updated them and they should be working now. Is it OK if we make the eggs the night before and hatch them the next day? Yes, absolutely! That’s what we did. We left them in the freezer overnight and hatched them the next day. So fun! This was a great idea! I’m going to use this at my daughter’s birthday party tomorrow! I used three boxes of baking powder to about 1/2 cup water. I wanted a much stiffer “dough”. They weren’t as squishy and held together very well. I tried forming them with an Easter Egg, but that didn’t work out too well so I just formed them by hand. Check out my post (to be written) on my blog plateandplant.com for pictures. Thank you! This is PERFECT for my son’s birthday party! Hi where did you buy the pokemon figures? You said 144 in a set. Thanks for any info.